EL DIARIO MAS LEIDO DE CATALUÑA DONDE DESTACA:UN REPORTAJE NOTICIA,CON FIRMAS DE LUJO SOBRE LA MUERTE DEL ILUSTRE ESCRITOR Y PENSADOR EUGENIO D'ORS.CONSTA DE UNA FOTOGRAFIA DEL FALLECIDO Y UNA PAGINA ENTERA.REPORTAJE SOBRE LOS FESTEJOS EN HONOR DE LA FESTIVIDAD DE LA PATRONA DE BARCELONA LA VIRGEN DE LA MERCED,CONSTA DE UNA PAGINA Y UNA FOTOGRAFIA.REPORTAJE DEPORTIVO SOBRE EL RALLY DE LOS PIRINEOS QUE HA FINALIZADO EN BARCELONA Y LA ENTREGA DE PREMIOS COMO LAS CLASIFICACIONES FINALES.CONSTA DE UNA PAGINA Y MEDIA Y TRES FOTOGRAFIAS. 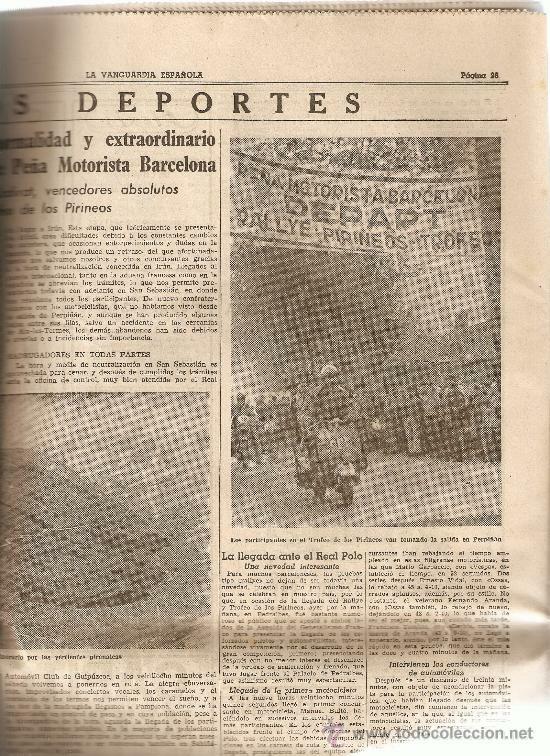 LA VANGUARDIA SEPTIEMBRE DE 1954.VUELTA CICLISTA A CATALUÑA.RALLYE PIRINEOS. Hora oficial TC: 22:28:50 TR: 81 ms.